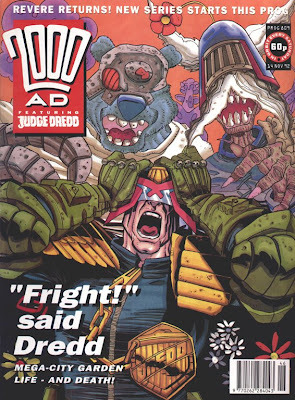 We're now heading into the final stretch of Garth Ennis's run on the weekly Dredd feature in 2000 AD--late 1992 and early 1993--and he sure seems to have been burning out. "Innocents Abroad" is a less inspired return visit to the characters and tone of "Emerald Isle," one of Ennis's unqualified successes on Dredd; "The Magic Mellow Out" is a thuddingly heavy-handed parody of the old kids' show The Magic Roundabout; "P.J. and the Mock-Choc Factory" is, I believe, the only P.J. Maybe story not written by John Wagner, and a weak imitation of his earlier appearances. The one-offs this time are particularly lame, for the most part, with cheap jokes and cheaper gross-outs. Has any other comics writer, with the possible exception of Geoff Johns, ever been so fond of dismemberment? Still, there are occasional flashes of interesting writing here, mostly when Ennis is writing something that looks more like the character-based drama for which Hellblazer was fanning his gifts at the time than like an attempt to be funny or to channel Wagner. Sometimes, returning to an idea from a Wagner episode gave him an excuse to do his own kind of story, as with "Unwelcome Guests," Ennis's second callback to "The Interrogation," with the return of the Random Physical Abuse test. (Incidentally, Judge De Gaulle from "The Interrogation" would make her final appearance only a few months later--but we'll get to that in due time.) And sometimes having more than six pages and a punch line to take care of let him open characters up a little. "Raider" is a pro forma Judge-gone-bad-for-love story with one great moment: the undercover seductress waiting until the entrapped man has walked away, then closing her eyes and whispering "worry about yourself." That's the side of Ennis that gets me every time. Even the better artists on these weekly episodes, though, seem to be getting it over with. Brett Ewins' "Last Night Out" is one of the stiffest things I've ever seen from him. Besides his evergreen cover for the "Unwelcome Guests" issue, above, the long-absent Ron Smith returns to phone in "A, B or C Warrior" (to be fair, the script doesn't give him anything particularly funny to draw). Greg Staples' investment in "Blind Mate" seems to have extended as far as coming up with a bucktoothed caricature of Cilla Black and drawing it over and over, interspersed with generic grim head shots of Dredd. 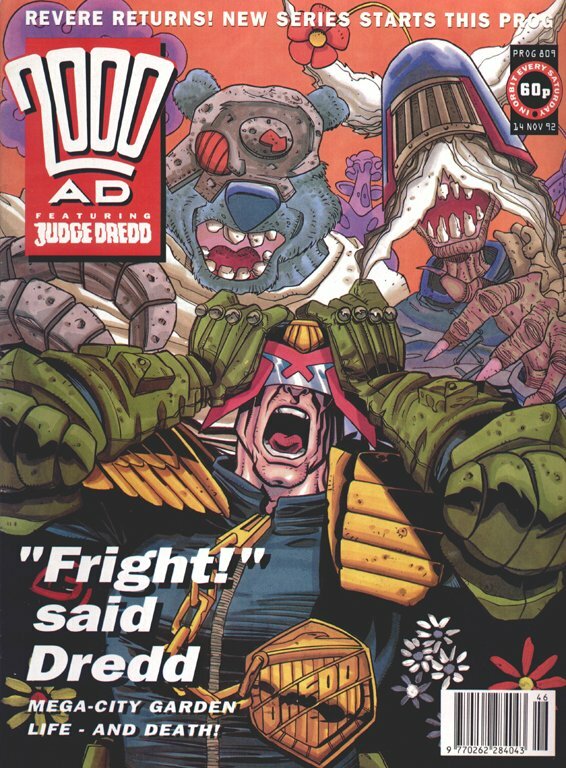 The final 2000 AD episode reprinted here is a plotless throwaway, "Happy Birthday Judge Dredd." It's notable as the first weekly episode written by Mark Millar, whose relatively brief tenure as Dredd's more-or-less regular writer would begin a few months later (following a ramp-up that included his own "Purgatory" serial, which launched in Prog 834, and the infamous Summer Offensive period)--not to mention the first weekly episode written by somebody other than Grant, Wagner or Ennis in well over ten years. 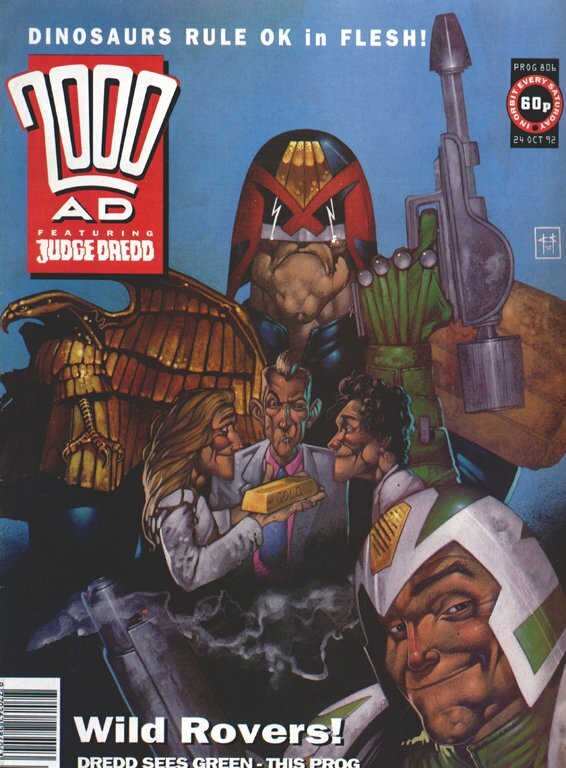 Since it ran in the April 3, 1993 issue, the birthday here wasn't quite 2000 AD's sixteenth birthday, though (Prog 1 was dated Feb. 26, 1977, meaning it would've gone on sale 35 years ago today: happy birthday, 2000 AD, by the way! 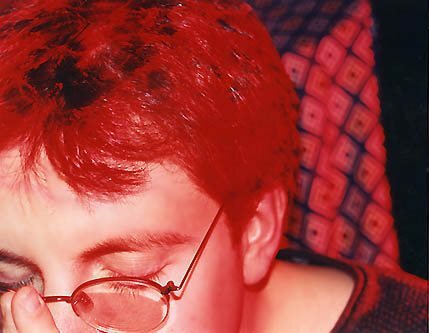 ), or the sixteenth birthday of the feature--that would have been on the anniversary of Prog 2. The Megazine had it a little better during this period, largely thanks to the first two "Mechanismo" serials. 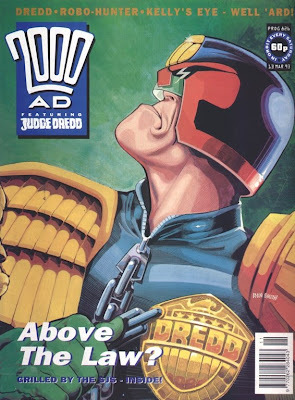 I'll be covering them in greater depth in a bit over a month, but it's interesting that for all the kinds of Dredd stories John Wagner had written, he'd never done an extended straight-up action piece of this kind before. It's essentially one long chase-and-shoot sequence, with an intermission in the middle. (As the first episode of "Mechanismo Returns" indicates, the eleven episodes reprinted here happen in the space of a single day.) Compare it to, for instance, the dense, talky "Day of Chaos"--and I should note that I love how dense and talky it is--and you get a sense of yet another way in which Wagner's range is broad. The intermission's not quite as much fun, aside from John Hicklenton's characteristically berserk art on Alan Grant's uncharacteristically berserk story "Resyk Man." Two of the four episodes between the first and second "Mechanismo" stories are the first Dredd work by Xuasus, a.k.a. Spanish artist Juan Jesus Garcia, who has the monumentally annoying habit of signing as many pages of his work as he can. On the other hand, given that this volume once again doesn't identify who wrote and drew which Megazine episodes, maybe he was onto something. For the record: other Dreddverse serials that were published during this era of the Megazine but haven't yet been collected in book form include Alan Grant and Carlos Ezquerra's "Armageddon: The Bad Man" (a creator-owned project that was supposed to eventually dovetail with the history of Mega-City One, but never got that far), David Bishop, Dave Stone and Shaky Kane's "Soul Sisters," several Dave Stone/Charlie Adlard "Armitage" stories, a couple of Jim Alexander/John Ridgway "Calhab Justice" stories, various "Judge Hershey" stories, and Garth Ennis and Nick Percival's "Sleeze 'n' Ryder." 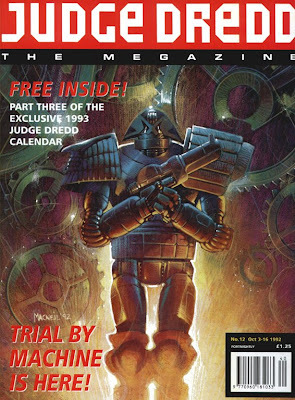 Case Files 18 is the final volume of the complete chronological Judge Dredd reprints published to date, meaning that the earliest never-reprinted episodes (aside from the contentious bits of "The Cursed Earth") are currently Prog 831's "Judge Who Lives Downstairs" and Meg 2.27-29's "The Jigsaw Murders." We're apparently due to get volumes 19 and 20, as well as Restricted Files 4, later this year; those should take us through "Inferno" and "Book of the Dead," at least, and perhaps up to the doorstep of "Wilderlands." Next week, though, thanks to this blog's "every book containing an episode we haven't covered yet, in those episodes' chronological order of first publication" strategy, we get the Titan treatment for the first time, with Goodnight Kiss, featuring Ennis's Jonni Kiss stories. The facial surgery will be happening this week, I suppose. I've been really enjoying your blog for a while now,although it has always made me a little sad that I stopped buying 2000AD sometime around Prog 730 or thereabouts. You've pretty much inspired me to buy all the Complete Casefiles, but now I'm getting into murkier waters as I'm about to transition from Casefiles to seperate albums and am not sure when to make the jump as there's some overlap. Am I better off buying the Mechanismo and Inferno TPBs, or the most recent two Casefiles and then jumping straight to Wilderlands, do you reckon?